Chin Up, Head Down describes the journey of a mother after her life was turned upside down on 2nd June 2009. On that day she learned that one of her sons had been killed by an IED in Afghanistan. It must be every mother of a soldier’s nightmare; that knock on the door, being told that your son has been killed. The rest of us have the luxury of being able to switch the channel after hearing the news, but for the families affected there is no such luxury. The book follows Helena Tym’s journey over the year and a half following her son’s death, from the initial administration and paperwork through to repatriation, burial and beyond – a life now marked by painful anniversaries of death, remembrance, and birthdays her son would never see. She is obviously writing at a time when the emotion is still raw, grappling with inner turmoil whilst trying to put on a brave face. Her writing is brave, dignified, and honest; she even shares her son’s last letter, only to be opened in the event of his death. 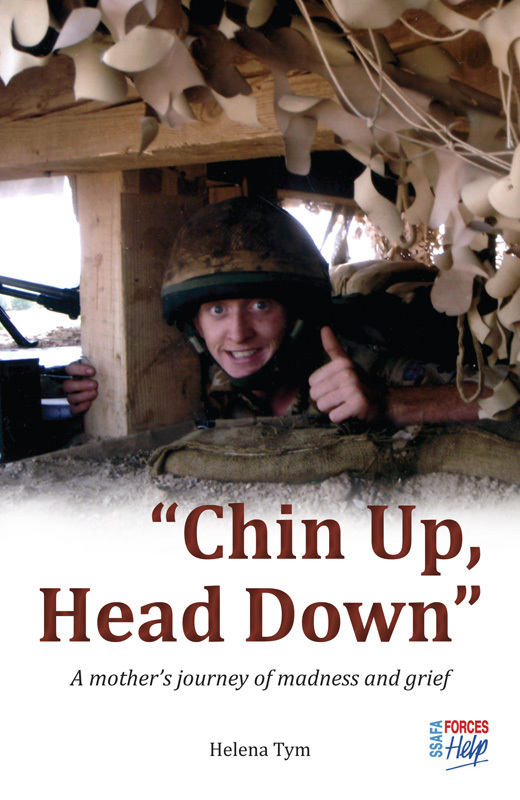 Chin Up, Head Down brings home the risks our soldiers take and the daily danger they face in Afghanistan. For many they may just be another statistic, but every one of them has a family who suffers. Whilst none of us can truly understand what these families go through, Helena Tym conveys the pain and anguish felt – a timely reminder of the importance of supporting both our servicemen and women and the families left behind.